This lettuce soup recipe is much more delicious than the name might suggest. Rich, buttery braised lettuce is bolstered with sweet shallots, double cream and plenty of dill for a wonderful summer dish. Try serving it chilled or blitz until smooth for variations on the recipe, and use vegetable stock to make it vegetarian. See Anna's other lettuce recipes here. 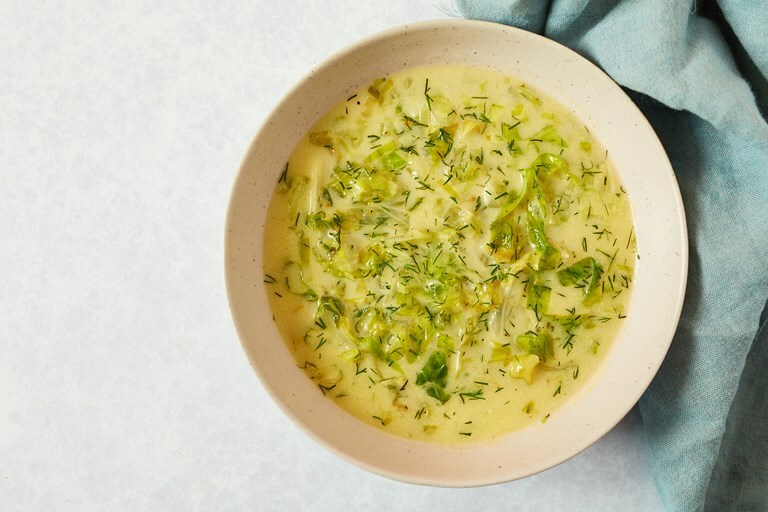 This is a light and elegantly flavoured soup, particularly good in summer. It is a wonderful way to use up slightly limp-looking lettuce in the fridge. You can use a mixture of different lettuces in this soup but do stick to green varieties and ones that have a more typical lettuce look (not things like frisee, lamb’s lettuce or radicchio). Alternatives: sorrel also works well in this soup – replace 100g of the lettuce weight with sorrel leaves (with the ribs of the leaves removed). It adds an extra astringency to the soup. This dish is also lovely served chilled in the summer. In this case, it is better as a smooth soup.